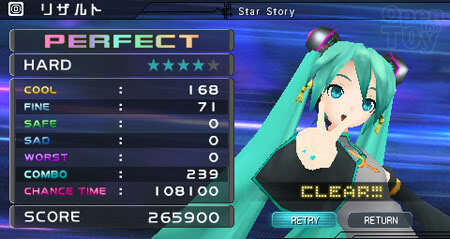 A friend of mine and I had spent countless hours trying to complete Project Diva. TunePimpJ03, being a music enthusiast, has a better grasp of rhythm and tempo and had completed all of the stages in Hard mode and some with Perfect. For me, I managed to get Perfect score in Hard mode for a only a few songs for now. Somehow the songs in the game grow on us and he decided to play some of the music pieces. Being creative, we try to recreate some of the songs in the name fun. It started to sound so good that we did a recording on it. So here is it! Feel free to give your feedback to us. We are trying to do more in the days to come. So stay tuned! Thx for more information on Project Diva. The link too! Wow.. how you do that? anyway, its very nice..